Size of this preview: 397 × 599 pixels. Other resolutions: 159 × 240 pixels | 1,024 × 1,545 pixels. 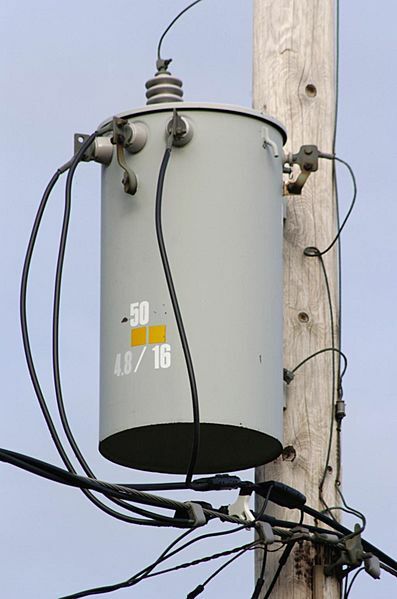 Description: Closeup of singlephase polemount transformer. This is a picture I took of the singlephase polemount transformer supplying my parents' cottage on Old Lakeshore Road, about 12 miles from Dunville Ontario. 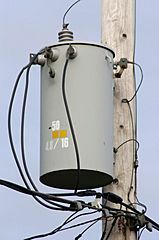 The transformer supplies their 200A electric service, as well as the electric services of various other cottages along that road. This image (Nikon D2h with wearable computer system), has been downcompressed to get it within the 100k suggested filesize limit of Wikipedia. Fullsize images (this and others like it) can be found linked from wearcam.org/christina/billru_cottage/polemount.htm. This page was last modified on 7 October 2017, at 09:46.